THE BODY OF a British soldier executed and buried in Co Clare almost 100 years ago has been exhumed and will be reburied in Dublin. 18-year-old Private George Duff Chalmers was a member of the 2nd Battalion of the British Army’s Royal Scots based in Clare during the War of Independence. He died on 10 June 1921 at Drumbaun in Co Clare after, it’s believed, he was captured and executed by members of the Irish Republican Army (IRA). Representatives of the Commonwealth War Graves Commission (CWGC), working alongside the Office of Public Works (OPW) and Clare County Council, today exhumed his remains from a site near Miltown Malbay. 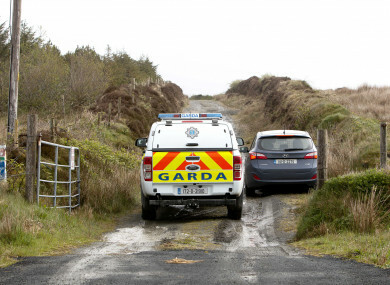 Gardaí also attended the exhumation. A spokeswoman for the CWGC said: “Until August 2016, Private Chalmers was not listed in the Commonwealth War Graves Commission’s records, despite being eligible. A review of the case by the Ministry of Defence saw Private Chalmers officially recognised and CWGC records were amended. In 2017 the CWGC was contacted by the family of Private Chalmers who enquired about the possible relocation of his remains to an alternative location. “CWGC identified that as the current location was difficult to access and maintain, relocation of the remains would be possible,” she added. Chamlers’ remains were taken to a church in Ennistymon where a brief prayer service was held outside. He will be reburied at Grangegorman Military Cemetery in Dublin. A rededication ceremony will take place later this year. War graves from World War I located in Ireland are managed on the CWGC’s behalf by the OPW. Email “Body of British soldier exhumed from bog in Clare ”. Feedback on “Body of British soldier exhumed from bog in Clare ”.